... the Celtic Lenormand Oracle! This deck, with illustrations by Will Worthington of DruidCraft and Wildwood fame, will be published in Autumn 2013. In the meantime, here I will show you the background to the creative process, posting images and sections from the companion book, as well as readings, once more cards are ready. 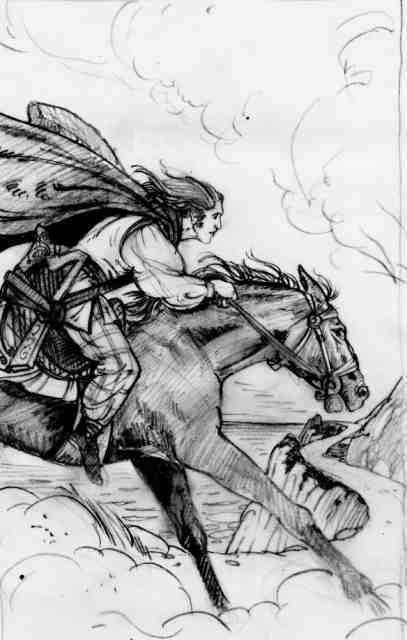 To start us off, here is a preliminary sketch of the Rider. He is a bard, who rides helter-skelter down a coastal path. At his side is his harp, the tool he uses to help spread news far and wide. Despite his intent focus on getting where he's going, and his look of being in a hurry, the sea behind him is calm. Although he is desperate to spread the news, the world isn't too fussed about what he has to say. Wahoo! Or whatever the Celtic equivalent of that would be. More tartan PJs! I have to say how much I love this as a sketch. It's so elegant and linear. Will you be writing the book Chloe? As for Will's artwork, I can hardly believe he calls this a "scribble"! Some of us could work a lifetime and our final pieces wouldn't be as good as his preparatory work, lol. Maybe the card backs could be one of his 'scribbles'. Maybe even this Rider scribble! I think for me it's going to become the logo for this deck. How exciting! I can't wait to see it unfold.